Our torso anatomy model is many years old but it hasn't lost any of its appeal. I find anatomy models irresistible. Anatomy models can help satisfy the child's natural curiosity and desire to know more about how our bodies work, what it looks like inside and what our internal organs look like. They are perfect for inquisitive children! Anatomy models provide for hands on learning. Most can be assembled and disassembled, allowing the child to learn through repetition. Due to the abstract nature of the models (the child needs to use their imagination as the models show the internal anatomy) I recommend them for children near or in the second plane of development (from six years). I can't tell you how much I love this! The booklets that come with the models are fantastic. All of our booklets contain diagrams and thorough descriptions. The animal anatomy models are wonderful too! They are perfect for research and for finding out more about specific animals or areas of interest. We've found them most useful for learning about different respiratory and circulatory systems. It's so good to be able to show the child how the dolphin breathes rather than just telling them about it or showing them a diagram. We have and love the Dolphin, Woolly Mammoth, Tarantula, Crocodile, and Hercules Beetle. Although my boys have been asking for the Shark forever. We've sourced most of our anatomy models in Australia at Mad About Science. It is ok to say that they also look awesome on the children's shelves, I love the natural science look which allows the child to make their own discoveries! It goes without saying that the home environment is very different to the school or Montessori infant/toddler environment. Things can get messy, children can get distracted and often parents are tending to more than one child at once without any backup. You don't need to be a Montessori teacher to give your child a lesson or demonstration. In the home, the child will need many lessons (or demonstrations) and you (the parent or caregiver) are the best person to provide them! If you mess up or if it just doesn't work out, give yourself a break, you can always come back to it in a week or in many cases much later. Don't think you or the lesson has to be perfect. Lessons can be as simple as how to use the Egg and Cup, stacking or threading toys to pouring a drink, cutting a banana with a blunt knife or doing up buttons or sweeping. Ask yourself if a lesson is needed before putting out new toys and materials or trying new practical life exercises. Remember most children will need more than one lesson before they master the work, don't worry if the child doesn't remember how to do something and you need to give the lesson again. Keep these points in mind as there are times when the opportunity for a lesson can arise spontaneously, you may be working in the kitchen and suddenly your toddler wants to join in, perhaps they are ready for peeling, perhaps now is the perfect time to give them a lesson. Generally speaking, pick the time when you and your child are rested and well fed. If possible choose a time when you can be your best self and give your attention to the child, keep in mind the lesson might only take five to ten minutes maximum. If possible plan and even practice your lesson. I've found this most important with practical life, how exactly am I going to show him how to put his shirt on, which way am I going to show him to do his laces, which hand will I use to support the grater? Work this out before you present to the child. Ensure you have all the materials you need and they are all in working order. You don't want to run off half way through because you have forgotten something, this can break the child's concentration and sometimes lose their interest. Keep it simple. Use a clear work surface (remove clutter), only have out on the work space (table or work mat) the materials you are using for this lesson. Remove distractions (turn off the TV, put away the mobile phone). Keep the lesson as simple as possible. Remember the child is absorbing everything in their environment. If possible work at the child's level. It's important that the child can concentrate on the lesson and not have to focus on balancing precariously on a kitchen stool or sitting at a table if the child isn't ready. Make sure the child is comfortable so the only thing they need to focus on is you! If working on the floor a little work mat can be useful. Sit next to the child if possible, it's often recommended that you sit on the child's non-dominant side. The important thing is your child can clearly see and imitate your movements. Try a wordless demonstration, this allows the child to focus on your hands, not on your mouth. Once the child has mastered the materials you can add some words and include a language component. Use clear, slow, and deliberate movements. If you move too fast your child might not be able to keep up or process the movements. Try to set up the work to flow from left to right. This will be in line with how your child is asked to work at (Montessori) school, but also prepares the child for reading and writing (also left to right). Be calm and gentle. Be respectful. Be kind and be patient. Allow your body language and tone reflect this. Don't worry or be discouraged if the child isn't interested in the lesson, wait and present it later, this is an indication the child isn't ready. Look for cues as to what your child is interested in and developmentally ready for. Don't focus on perfection, it's not a reality. Your child will benefit from your efforts and after a few lessons, you will learn what your child responds to best. Your child will also become familiar with your teaching style! Ask yourself if it's possible or suitable to have an older child present the lesson. Otis has struggled with tying his shoe laces and having his older brother demonstrate to him was really helpful. In the kitchen and with many practical life activities, I've found it best for the child to have their own materials and work along side me. For example, once the child has grasped the general concept of grating, they can use their child sized grater to grate along side me while we prepare dinner. This gives the child the opportunity to improve their skills (by observing) in a low-pressure environment and it also allows you to observe your child and perhaps see what areas they need help with. Teaching your child a new skill can be incredibly rewarding and can be a little moment in the day for just the two of you. It's also a great time to slow down and connect with your child. Let me know if you have any tips for presenting a lesson to a toddler at home! Preparing for Baby with Milk & Co. I am now at the end of my pregnancy and the baby could (should!) come any day now. I am more than prepared and ready. My hospital bags are packed and by the door. We haven't installed our baby car seat, but it's the only thing left to do. I can't wait to be on the other side, with our little baby in our arms! To help us prepare Milk & Co (Michael Klim's company) sent us some of their favorite baby products to try! We loved them so much most have become staples in our bathroom. I thought you would like to hear about them so, I've given a little review below. We've found all the products to be gentle on our children's skin and great quality. Bath Time Wash - Bath wash which can also be used as a gentle bubble bath. All of the Milk & Co products are quite thick and gloopy (not thin and runny) so a little goes a long way. This lasts forever. It is lightly scented with lavender. Shampoozle + Conditioner - Shampoo and conditioner in one which is ideal for my children who generally don't like to wash their hair. It has a gentle fragrance and works well for Otis who has a dry scalp. I can't pick the fragrance, perhaps a little strawberry/fruity fragrance - it's nice and fresh without being overpowering. It leaves the child's hair shiny, soft and smelling beautiful. While it lathers (see Otis in bottom picture) it doesn't run a lot so it's easy to keep it out of the child's eyes. Moisturising Qweam - Moisturiser which is thick and absorbent, it leaves the skin silky smooth. We regularly use this without problems on Otis who has sensitive skin. Could be used for a light massage after bath time. I love the feel of this on my hands after applying it on the children, I would happily use it on myself! Snotty Grotty Room Spray - I can't tell you how good this is. We are almost out of winter and my kids only got sick a few times, but there were lots of mild runny noses and a few coughs. This is perfect to spray into their room at bedtime or just after a bath. It is incredibly freshening and soothing. You can read all the ingredients here, it contains tea tree, eucalyptus, peppermint, rosemary, sandalwood oil and ylang ylang. Smells fantastic. Fairy Detangler Hair Detangler - My children don't need a detangler, however, this helps to style their short hair and make it nice and shiny. We use it before going out, to neaten up their hair, especially if we are going out for dinner after school and the boys don't have time to shower. All Milk & Co products are Australian made and have gorgeous packaging. They are cruelty-free (don't test on animals) and are paraben free. The baby range isn't just for babies, my children are loving and using all these products. Milk & Co products can be found online, in selected Woolworths and Coles store and at Baby Bunting. Selected Milk & Co products are available in the US here (the Australian site ships international). Also pictured is the Hevea natural rubber duck and Stokke flexi baby bath (in top images with newborn attachment). We know there is a lot of information online and in books about Montessori. But what is available specifically for new parents setting up a Montessori home? Here are some of my recommendations. Book: In a Montessori Home: A parent's guide to preparing the home for children birth to three. This is a booklet (it's brief) and can be hard to get outside of the US. If your children go to a Montessori school, ask for it in the parent library. If you operate a school or are involved in a Montessori community this is a good one to have in the parent library. Website: The Montessori Company - Home Environments has lovely interactive illustrations of infant and toddler (birth to three) bedrooms. While this is really useful for bedrooms only, it is really detailed and a fantastic guide. Blogs: My favourites are here. Keep in mind that blogs are often very personal. You are taking a peek into someone else's home. This may give you lots of ideas and inspiration or it may not help you in your home environment. I suggest to read widely, note what you like and discard the rest. E-Course: The Montessori Notebook - Setting Up Your Home Montessori Style, online workshop. This is perfect for parents who are committed and ready to make changes in their home. This is self-paced and packed full of information, examples, and support and includes all areas of the home. If you are close to or if your children go to a Montessori school keep an eye out for any talks or presentations on setting up your home Montessori style, or why not ask if the school can put something on! Also, never be afraid to ask your child's teacher for help and advice. If you are new to or just starting to look into Montessori in the home, I hope you've found this list helpful! Have a wonderful weekend! It's almost as if the child has so much fun with the materials they forget they are learning essential literacy skills. All while using movement, concentration, and fine motor skills. Using multi media also trains the child's eye to identify the written language in different forms, in different sizes, different fonts, shapes, and colours. Otis has good literacy skills (by my own assessment) however lacks confidence. Being one of the youngest in his class doesn't help. So my aim is to encourage the development of these skills through play and fun activities only. Stickers and stamps are always popular in our home! Here Otis is using the Melissa and Doug Alphabet Stamps. I love that they come in upper and lower case, they are great quality and print really clearly. After Otis has finished he just gives them a quick wipe clean. I love Melissa and Doug trays too, in this tray we've left the stamps and included lots of alphabet stickers. We've put them into a larger (A4) tray with the ink pad, paper and mini coloured pens. This modest little tray has led to lots of writing, lots of stories and lots of letters! I actually really like the look of letters and cards using lots of different media, types, and fonts. Our Melissa and Doug Alphabet Stamps are c/o Parent Direct. We've always loved the quality and style of the Melissa and Doug stamps, we also have the transport and animal stamps. If you are in the US you can find the Melissa and Doug Alphabet Stamps here. Today was almost magical. It was so warm (around 30 degrees celcius) and a public holiday, yes on a Wednesday! And we made one of our favourite foods - donuts! We actually made mini donuts, these are much smaller than they look. But they are a lot of fun to make and to decorate! We are using and loving the Babycakes Mini Donut Maker. You can see Otis using the donut maker above! We used the recipe below but there are also recipes in the instruction booklet. In a large bowl mix flour and caster sugar. Add butter, egg, milk, and vanilla. Use an electric beater to beat until the mixture is thick and smooth. Preheat Babycakes Mini Donut maker. Put mixture into a pastry bag (or plastic food-grade bag with the corner cut off) and pour evenly into each donut mould. Bake in donut maker for 1-2 minutes. Remove donuts from donut maker and place on a cooling rack to cool and then decorate! Makes around 24 mini donuts. We burned our first sets of donuts, so be careful, it only takes 1-2 minutes to cook, don't leave them unsupervised. It was intentionally a bit of a free for all in the decorating department. It's where the fun is! Who feels like a donut? These would be so good for playdates or for birthday parties. Perfection! For Australian readers I purchased our Babycakes Mini Donut Maker in the US, I couldn't find anything similar in Australia and it was so affordable with fantastic shipping, we already had an international power plug/converter so we were happy with the US version. Are your children collectors? My children have collected different things over the years. As toddlers, my children loved collecting rocks and sticks. I put a basket by the front door so they had a place to put them all. One of the things I have learnt as a parent is that we need to allow children to become who they are. They might have weird interests or not fit into our aesthetics but that's them. We need to support our children, to follow the child and this includes what ever they need to collect. Caspar has a collection of old and foreign coins. This has been driven by friends and family who pass their coins to him after traveling and a grandparent who also has a coin collection. Otis mostly collects found things, feathers, dead insects and interesting seed pods and rocks and minerals. It's fun to watch their interests evolve into collections or for their collections to change as their interests change. Collections are a way children can express themselves, learn more about their interests and take pride in their work and collecting efforts. Collections can teach children more about the world in which they live and can also provide an interesting link to the wider community. So I've been thinking, how can we support our child's collecting and collections? Provide or suggest correct or professional tools - think microscopes, scalpels, tweezers, measuring devices, magnifying glasses, guides. Support the storage of collections - acid-free paper, collection books, adequate storage or discovery boxes. Provide books or help find research books so the child can learn more about their collection. If possible allow them to arrange or display their collection, as desired. Role model, look after your own collections, share your collections and interests with your child. Some collections are purely practical, Otis has a fantastic collection of over fifty cookie cutters, it's always a delight when he finds an interesting and new one. Do you have a collection? Many classrooms are being reorganized, cleaned and set up fresh for children returning from the summer break. Here are a few classrooms that I am loving, ready for the new school year! Above a toddler class at Guidepost Montessori, USA. Preprimary class at La Montessori Nurtury, Iowa, USA. So much light, a classroom at the Montessori School Bali, Indonesia. Mountaineer Montessori School, West Virginia, USA. You can see more of their classroom pictures here. Cosmic Montessori School, Jakarta, Indonesia. 3-6 years classroom. Laniakea Montessori in Gainesville, Florida, USA, Geography or Culture Area, 3-6 Classroom. Good luck to teachers and students heading back to school! What are the Montessori Binomial and Trinomial Cubes? Do you know what these strange cube things are? What are they used for? What exactly do they teach? If you've never been into a Montessori classroom it's possible you've never seen these before. If you have been into a Montessori (3-6yrs) classroom you may have seen them, your child may have even shown you how to use them? I was introduced to the Binomial and Trinomial Cubes at a Parent's Maths night at our Montessori School in Canberra, many years ago. If you can make it, these nights are really worth it, at least once in your parenting journey. 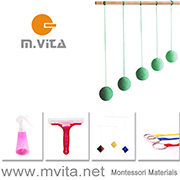 The Binomial and Trinomial Cubes are Montessori Sensorial Materials found in the Cycle One (3-6yrs) Classroom. The Binomial Cube is introduced first and then later the Trinomial Cube. The blocks are colour coded and are different sizes to represent the algebraic Binomial and Trinomial formulas. The purpose is not to teach maths but to challenge the child to find patterns and spatial relationships. It is best to think of these as three-dimensional puzzles. The child is taught through demonstration to systematically deconstruct then reconstruct the cube. Each cube has a control image on the lid of the box which may assist the child. They also have a control of error, when they are successfully completed they will form a perfect cube. These are fantastic hands on learning materials that indirectly prepare the child for maths and later algebra. They are good examples of the child learning the concrete before learning the abstract concept. The Binomial Cube is a concrete representation of the algebraic formula (a + b)3, you can find the full formula here. The Trinomial Cube is the physical representation of the trinomial formula (a+b+c)³, you can find the full formula here. Above is the Trinomial Cube Layer One. Layer Three and finished! The child can also build the cube outside of the wooden box or while wearing a blindfold, using their sense of touch only. Our Binomial and Trinomial Cubes are c/o Montessori Shop. If you are in the US you can find similar cubes here and here. I absolutely love this Montessori inspired bathroom at Wunschkind - Herzkind - Nervkind. I love all the hooks and accessories. This is the best! A story of how one Montessori teacher, Gavin McCormak, has made a difference to a community in Kathmandu - Sydney Montessori Teacher Uses Community Links to Build School in Nepal. This toddler space. For a child from 14 to 20 months. Family and Co is a lovely Montessori blog to follow. New Montessori parent child classes open up in Sydney. 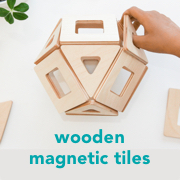 These Wooden Single Shape Montessori Puzzles from HeirLoom Kids USA (on Etsy), I love the wood grain. Are you following the Montessori Notebook Summer Series of Montessori Home Tours? Have a read for lots of Montessori home pictures and ideas. This is very different to Montessori but you might still enjoy it! Setting up the 3rd Teacher: A Peek into Nammi's Classroom at Fairy Dust Teaching. This is a Reggio inspired classroom. Did you know that next week (12-20 August 2017) is National Science Week? Do you have any activities planned? To celebrate we have partnered with Parent Direct to share one of our favourite STEM toys, which is an early coding activity. Coding is something Caspar started learning in his Cycle Three Class (9-12 years) and he has also attended a few coding workshops. But what about for younger children, what can we do to prepare younger children for coding? The Code and Go Robot Mouse is the perfect pre-coding, early coding toy! Our Code and Go Robot Mouse (as pictured) is c/o Parent Direct. The Code and Go Mouse is for children from 5 years. Most five year olds would still need some help to set it up and to read the instructions but could do the coding part on their own. Children up to nine to ten years old would find the robot mouse useful and interesting if they are new to coding. This is an activity the child could use or play on their own but beacuase of the problem solving component, it's really good for group, team work or even for the adult to do with the child. Coding is about so much more than the actual instructions programmed, it's about problem solving and most importantly critical and logical thinking! The aim is to program the mouse to find the cheese. You can set the course up to be as easy or as difficult as you like. The mouse works perfectly on the floor or table surface but you can also use the tracks and make an obstacle course or maze as pictured. Activity cards are provided to give the child ideas or courses to try. The child can use cards to map out the course and to help program the mouse. You can see the cards (pictured above) relate directly to the buttons on the mouse. Once the child has the path mapped out, they can use the buttons to program the mouse. This is a hands-on way to learn coding! There is lots of movement and activity built into this type of learning too. It's a good fit for introducing Montessori children to coding. Programming the mouse is a lot of fun and there is always lots of laughter. It took Otis lots of playing around and experimenting to correctly program the mouse, so there were lots of funny mistakes made along the way! And there are huge claps and celebration when the mouse successfully finds the cheese. The mouse and cheese concept is really cute and the mouse makes the best little squeaking sounds. Is coding important to you? Basic coding impacts all of us who use the internet and it is starting to be considered a core skill. But even if it's not, the thought processes that the child uses in coding is useful in so many areas of their learning such as maths and science and almost all STEM activities. Thank you to Parent Direct for our Code and Go Robot Mouse. If you are in the US you can find the Code and Go Robot Mouse here. I hope you enjoy National Science Week 2017!